In the center of our own galaxy lurks a supermassive black hole thought to have a mass four million times greater than the Sun. The Milky Way isn’t the only galaxy with a giant black hole in the center, but ours is right next door in astronomical terms. New observations of the center of the galaxy reveal a grand occurrence — the black hole that binds the Milky Way together is currently tearing a small piece of it apart. Scientists are watching as a huge ball of interstellar gas is being gobbled up. Despite being just 25,000 light years away, we haven’t been able to watch the super black hole, known as Sagittarius A*, go about its business of sucking down matter. Sagittarius A* (pronounced Sagittarius A star) is so massive that it’s cleared the space around it of readily observable debris. This gas cloud (dubbed G2), while not tipping the scales, is large enough to be spotted from Earth — it’s about three times the mass of Earth. Earlier observations indicated the gas cloud might be consumed completely, which would have been interesting in its own right. 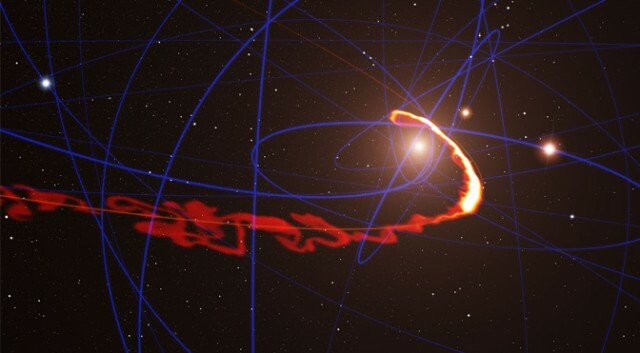 However, a new 20-minute exposure done by European Southern Observatory’s Very Large Telescope (VLT) in Chile shows only part of G2 has fallen into the black hole. The bulk of the gas is being flung outward in space by the gravitational slingshot effect. In 2004, the gas cloud was spherical as it began accelerating toward the black hole. Over the intervening years, the front edge of the cloud was pulled along faster than the back by the intense gravitational gradient. This process is known as spaghettification, and it has resulted in the cloud stretching into a thin oblong shape as it whipped around Sagittarius A*. 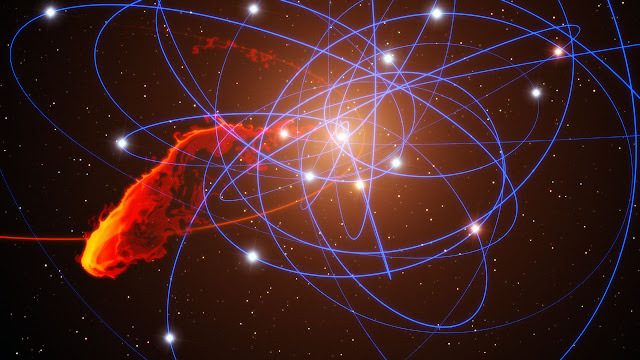 At its closest approach, the cloud was only 15 billion miles (25 billion kilometers) from the black hole, which imparted a lot of energy to the mass that escaped. The leading edge of the remaining gas is now flying in the general direction of Earth at more than 6.2 million miles per hour (10 million kph), or about 1% the speed of light. The mass that didn’t reach exit velocity as G2 was torn asunder is accreting around Sagittarius A*, and will soon be sucked into the black hole. Astronomers are interested in watching both of these processes play out. The video above projects the appearance of the gas cloud over the next few years as it continues to coast through space. This is a unique opportunity to test a number of theories regarding how the incredible gravity of black holes influences matter. Telescopes are going to be pointed at the galactic core over the next year as the process continues to play out. Well, technically it played out 25,000 years ago, and the light from the event is just now reaching us.